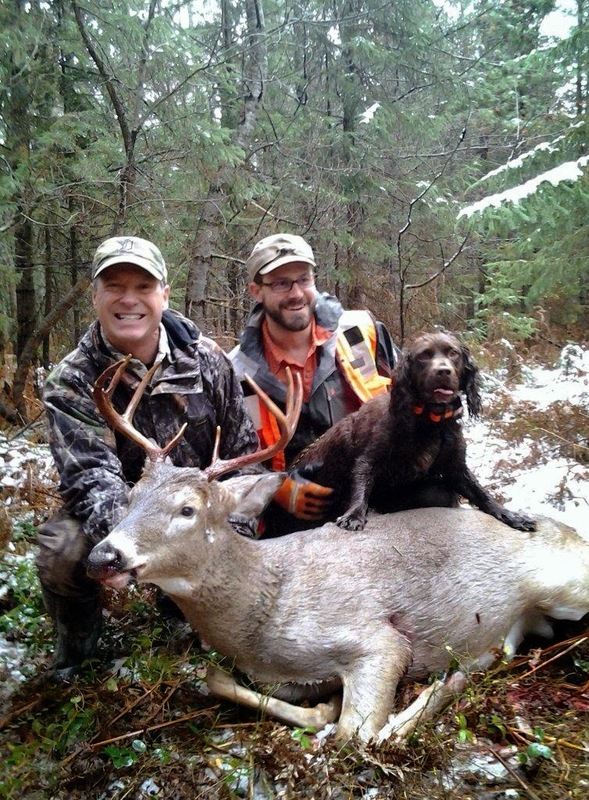 A very special thanks to Robert Miller and a talented dog named Sypris who helped me find the doe I had shot last night in the Lapeer State Game Area. 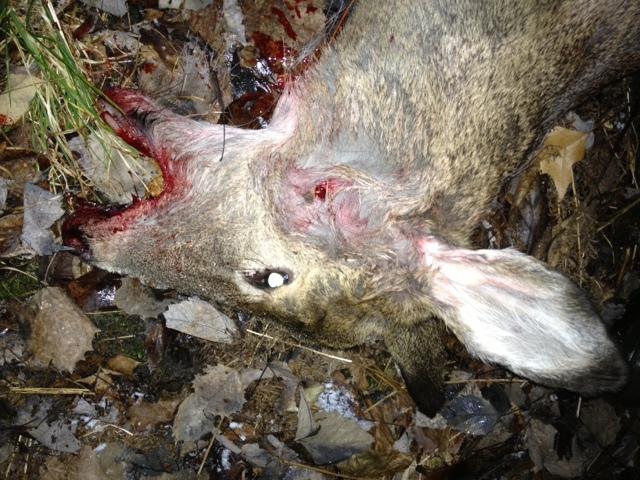 A head shot at this deer through a very small opening through the trees and it dropped on the spot. I waited a few minutes after the shot and seen no movement thinking that the crosshairs from the scope placed between the eye and ear had hit true. I threw out a loud grunt from the grunt call and the deer jumped up and took off but soon after I heard two distinct crashes where it must have plowed dirt. I quickly descended from my tree-stand and looked for blood at the spot where the shot was placed but only seen hoof marks in the dirt. I followed the tracks and was on a blood trail in less than 10 yards with the first spot found where the deer had crashed down hard. I followed the trail for awhile maybe near 100 yards before having trouble locating blood and frustrated about the shot I had taken. 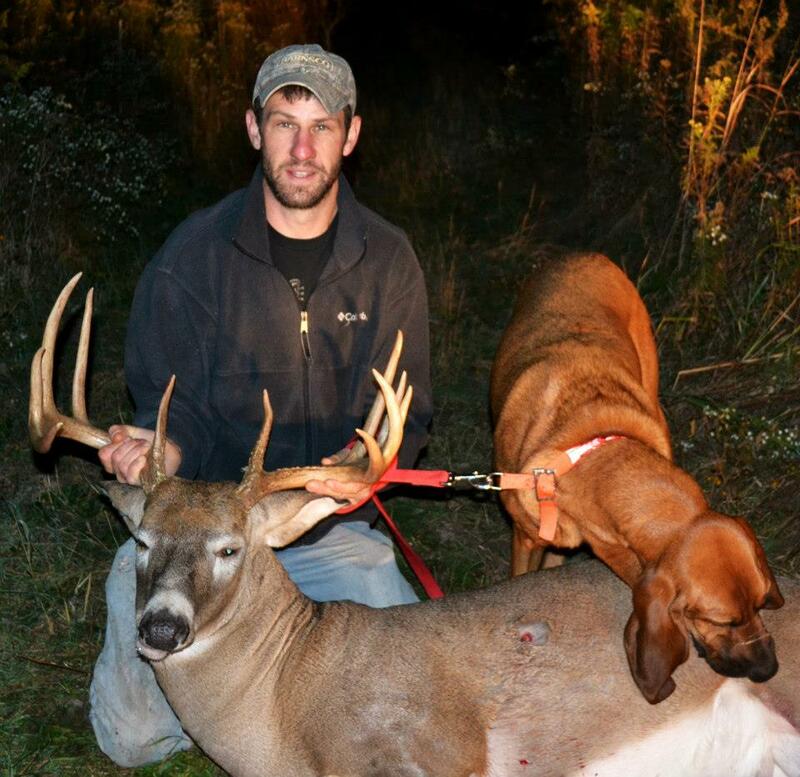 The only right thing to do was call up a professional and give it everything I could to locate this deer. 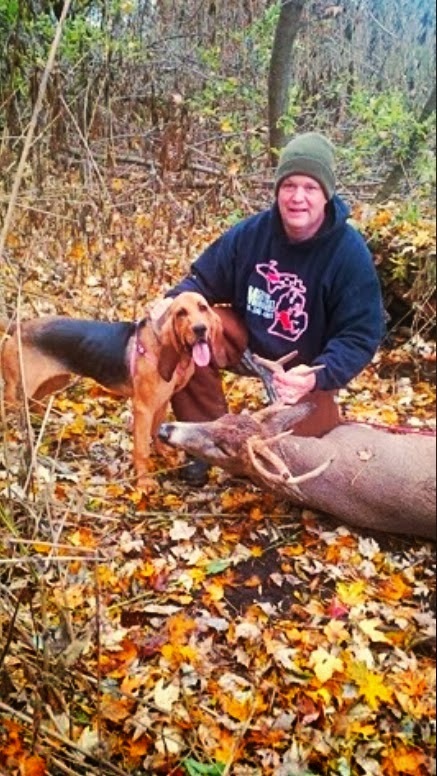 Rob was quickly on the scene and reviewed the information of this hunt. His dog Sypris was quickly on the blood trail and carried on from where I could not for at least another 200 yards to the Sand Hill Drain Creek. It was fun to watch the dog sniffing blood that was floating on the water and turning over leaves on top of the water to get back on the scent trail. My thought was to continue to look on the other side of the Creek while Sypris was determined to stay on the same side of the creek with a double back in the same direction from which we came. Sypris has proven her skills with the doe found along the edge of the creek near thirty yards or more back from where we first came across the creek. 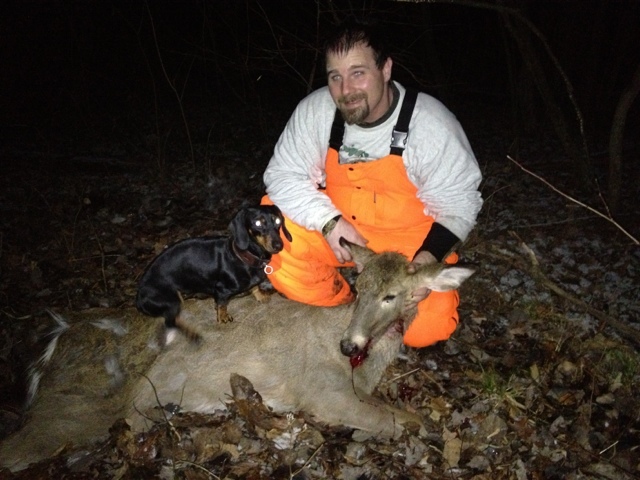 Rob and I reviewed the shot placement which was a half inch slug hole two inches below where I had fixed the crosshairs of the scope and I was sure glad that I had made the call for Rob and his tracking service or this deer would have been lost. I truly give a special thanks to Sypris with an amazing talent that has allowed me to have venison this year and sleep a little better at night. Thanks again Sypris and Rob for all of your help!